Tim’s book has been a real eye opener. Tim walks you through the steps from getting started to running your IT services business successfully. Highly recommended. Tim’s experience in the MSP space is deep and wide; his approach to business coaching is thorough and insightful. Tim Taylor Consulting Group uncovers technology barriers to business growth, and use their unique blend of business and technology experience to solve your unique challenges. Our proven methodologies, tools and best practices fast-track your IT business transformation. In his book, How to Start and Run a Successful IT Company, Tim paints a colorful picture of how he started and built his IT company and turned it into a thriving Managed Services practice. Starting from scratch – literally out of the trunk of his car – today TaylorWorks is a multimillion dollar business that serves hundreds of clients. He is here to share his wealth of experience and help you start and run your practice or add Managed Services to your existing line of business. How to Start and Run a Successful I.T. 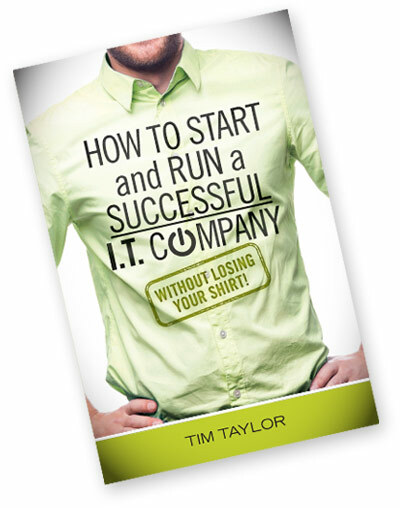 Company without Losing Your Shirt shows the fundamentals of how to actually start your own IT company. Do people say you should start your own business but you have never known how? Are you sick of working for others? Find out what it really takes to start from scratch and run a successful company. All of Tim’s coaching tips in this book! Tim was recommended by a longtime, trusted friend. After my first meeting I knew Tim would be the guy to help me in launching my Managed Services Practice. Tim’s experience in the MSP space is deep and wide; his approach to business coaching is thorough and insightful. With my 20-plus years in the IT field, I knew nothing about marketing and selling MSP services. Tim has taken me step by step through that critical process which I consider invaluable. I am months ahead of schedule because of the insightful support that Tim Taylor has provided. I recommend Tim to anyone looking to begin or grow a Managed Services Practice!